"I know that what has happened to my kids and the way I've handled it has impacted our whole family. I get that. But how do I fix it for them and for me?" Does your family need deeper healing? If you’ve had a lot of upsetting events, relationships that don’t feel good, dysfunctional relationships, emotional, physical, or sexual abuse, addiction, trauma, divorce, or you grew up in a dysfunctional family with any of those experiences, the HOPE package is for you. 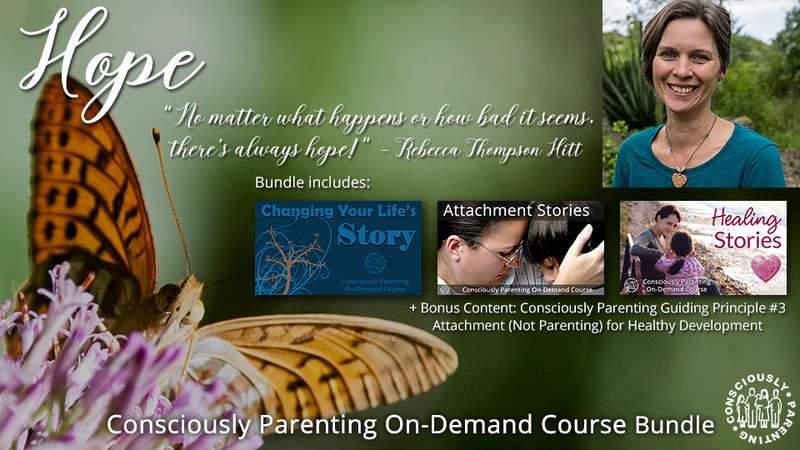 This bundle gives you support to understand your own story and your child's story so that you can create healing and integration in your family. Changing Your Life’s Story (5 hours of content) is probably the glue that holds all this content together. You’ll learn why experiences that happen before we can “remember” them matter, why attachment isn’t something that’s over once a child turns 3, how the physical body tells the story, how to heal through telling your story, and then how you can change your behavior patterns. It’s deep and comprehensive and can literally change you and your family in a profound way. Healing Stories (over 4 hours of content) is a tool you can use to help you to create a safe space in your home to connect with your own experience and your child’s experience, even with babies. Start at the beginning of the series, even if you no longer have little ones, as it contains a lot of the important components of Healing Stories. Each step will guide you through the shifts you need to make to heal. The Attachment Stories course (about an hour of content) helps you to understand your own patterns of attachment in relationships and your child’s, too. The last video contains suggestions for how you can create more connection with your child, regardless of what has happened before, starting right now. As a bonus, you’ll get the Attachment (not parenting) for Healthy Development (20 minutes in short segments), what attachment looks like at all ages of development, what survival has to do with attachment and how that shows up in our bodies, attachment and the grown-ups as we look at our own attachment patterns, and more on attachment and bonding with our kids of all ages.